The Grundy Art Gallery is opening up its collection during 2013 with a series of free sessions, each focusing on a number of artworks from the gallery’s permanent collection. 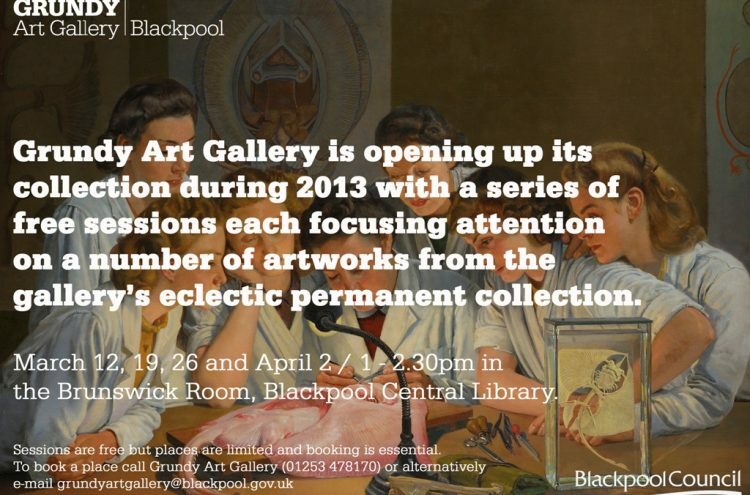 The sessions will be held on 12, 19, 26 March 2013 and 2 April 2013, between 1.00 – 2.30 pm, in the Brunswick Room, Blackpool Central Library. Sessions are free but places are limited, so booking is essential. Please contact the Grundy on Tel: 01253 478170; Email: grundyartgallery@blackpool.gov.uk.